Sitecore Processing Engine is a new ASP.Net Core based job of xConnect that works as a Windows service (or Azure Job). In order to run our custom code inside processing engine we need to make quite a number of configuration changes, register our custom types, inject our services, figure out how to access to xdb, etc. In this post we will review the basics of coding for Sitecore host applications (it applies to all xConnect jobs: processing engine, automation engine and indexing worker). For our demo scenario we create custom MLNetService that will be a layer between Processing engine and Machine Learning engine. So how do we register custom service is Sitecore processing engine? To register our service we need to add the following xml config to “xconnect_instance\App_Data\jobs\continuous\ProcessingEngine\App_Data\Config\” folder. How can we debug our code? Because of processing engine works as a Windows service we need to attach to Sitecore.ProcessingEngine service. 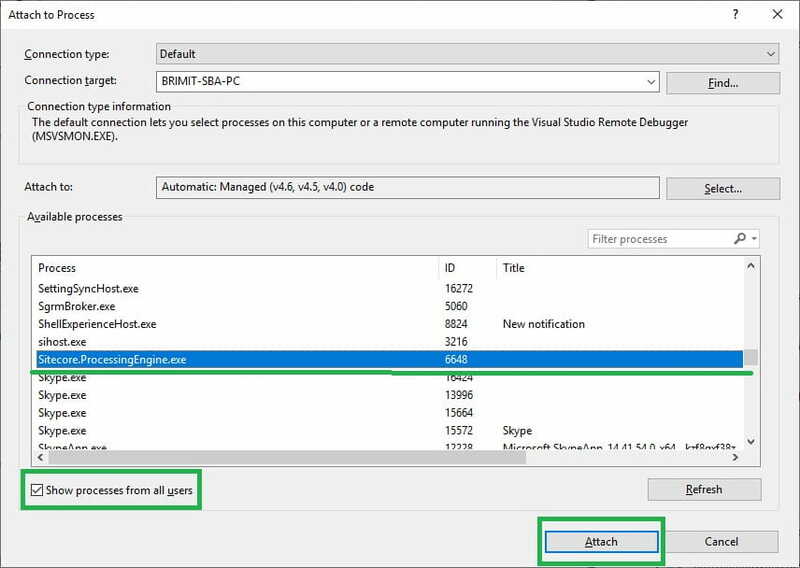 To do this, we need to configure debugging in Visual Studio: open menu bar, choose Tools > Options. 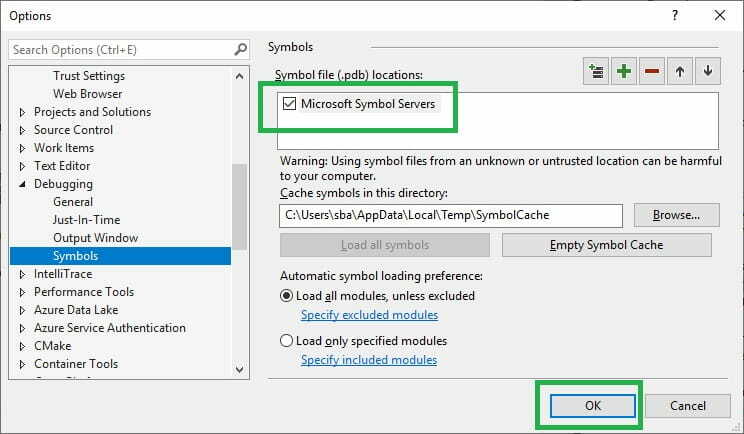 In the Options dialog box, choose Debugging > Symbols, select the Microsoft Symbol Servers check box. Then on the menu bar select Attach to Process from the Debug or Tools menu, in Processes dialog box select the “Show processes from all users” checkbox and find Sitecore.ProcessingEngine service. In response, you will see the ID of your task and you can check it in ProcessingEngineTasks database. [Information] TaskAgent Executing worker. Machine: BRIMIT-SBA-PC, Process: 4132, AgentId: 4, TaskId: 8faf6763-c623-45b7-a987-f08c9efc71d9, TaskType: DistributedProcessing. [Information] TaskAgent Worker execution completed. Machine: BRIMIT-SBA-PC, Process: 4132, AgentId: 4, TaskId: 8faf6763-c623-45b7-a987-f08c9efc71d9, TaskType: DistributedProcessing. [Information] TaskAgent Executing worker. Machine: BRIMIT-SBA-PC, Process: 4132, AgentId: 4, TaskId: c27c8eaa-efb2-42c5-b638-5357f76c3460, TaskType: DeferredAction. [Information] TaskAgent Worker execution completed. Machine: BRIMIT-SBA-PC, Process: 4132, AgentId: 4, TaskId: c27c8eaa-efb2-42c5-b638-5357f76c3460, TaskType: DeferredAction. [Information] TaskAgent Executing worker. Machine: BRIMIT-SBA-PC, Process: 4132, AgentId: 4, TaskId: bc344b9f-f22a-4074-bcef-76578d85a045, TaskType: DeferredAction.